Mooney birdied the third, seventh, 14th and 16th in an impressive four-under par effort to finish on three under par, a shot inside the Top-10 who earned starts in the European Tour’s flagship event. Foyle Golf Centre’s Brian McElhinney (73) and St Margaret’s John Kelly (74), the Irish Order of Merit winner, tied for 20th on six over. Hutcheon (67) and Cort (70) had tied at nine-under-par for the 54-hole tournament just ahead of overnight leader Matt Ford. But following pars on the first and second extra holes, Hutcheon hit a five iron to six feet to secure the £15,000 title with Cort only able to make birdie in increasingly gusty conditions. 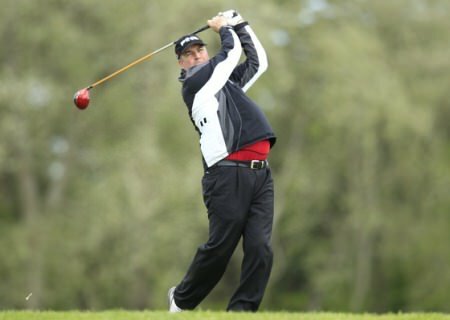 Hutcheon’s spoils include a place in next year’s BMW PGA Championship and the Wales Open but he admitted he was close to missing out altogether after a dreadful run of 18 holes midway through the tournament. 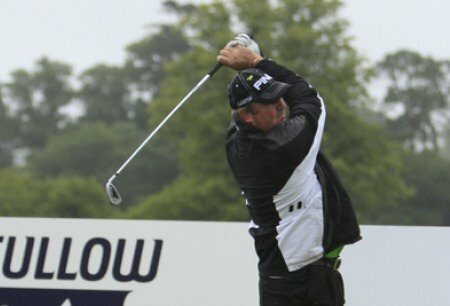 “I’m really chuffed to win because although I played well today I feel the reason I won was the last 14 holes of the second round and the first four holes this morning where I played so badly and really struggled but still managed to cover those holes in just about level par,” said the Banchory pro. Hutcheon’s final round 67 was a veritable rollercoaster with three bogeys, including two on the first two holes, five birdies and an eagle. 18th which he birdied for the third time this week to book his place in the play-off. It also erased for good the double bogey demon on the same hole last year which cost him an automatic PGA Cup place. 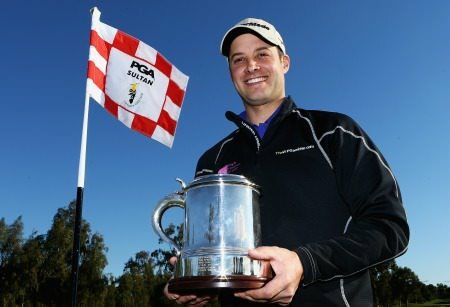 “It’s really a huge honour to be the PGA’s number one, I’m delighted to win it again and it caps off a really good season for me bar winning my singles in the PGA Cup,” added Hutcheon who also won the Tartan Tour and Scottish PGA Championship. The players were forced to briefly leave the course for 40 minutes following a lightning strike and on resumption Ford saw his hopes go up in smoke with bogeys on 15 and 16. Despite a superb birdie on the last hole his 72 left him one place behind the joint leaders. Meanwhile Cort holed a brilliant up and down on 18 to make the play-off and despite eventually losing out to Hutcheon was happy to book a return to Wentworth after missing out last year. “I was head to head with Matt (Ford) for a lot of the time and thought it was between him and me,” said Cort (pictured below celebrating his putt on the 18). “I played nicely all day but took too much club on 18 and holed a putt on the last which, given the circumstances, was probably one of the best putts of my life. “I said all week finishing first or second would be a massive bonus but having played well all week it was a shame I couldn’t get to win. Ford was left rueing a double bogey on the first and a bogey on 16 where he found the water on both occasions. “They were a couple of poor shots but probably got punished more than they deserved,” he said. St Margaret’s John Kelly during this year’s Irish Open at Carton House. Picture: Thos Caffrey / www.golffile.ieOrder of Merit winner John Kelly produced a storming finish to keep his victory hopes alive after the first round of the 54-hole PGA Play-Offs at Antalya Golf Club in Turkey. 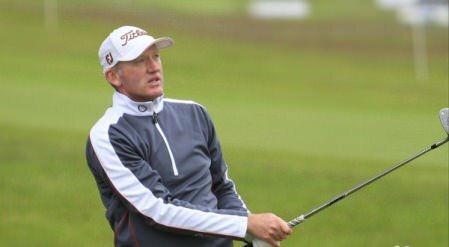 Ballyliffin’s Damian Mooney shot a second round 70 in the Titleist PGA Play-Offs in Turkey to keep his hopes alive of a first appearance in the BMW PGA Championship since 2004.